Quality Air Heating and Air Conditioning offers total heating and air conditioning service in Galloway, OH for many different types and brands of systems. From furnace and heat pump installation to central AC and ductless mini split repair, Quality Air Heating and Air Conditioning is the company to call. Our company is built on the idea that our customers are our bosses because without you, we wouldn’t exist. That’s why we like to stay focused on our customers’ satisfaction and on the quality of work that we do. We offer 24/7 heating and air conditioning repair in Galloway, OH because we know that your HVAC system isn’t on a predictable schedule. Call us anytime and you’ll always get a live person on the other end of the line. From installation and maintenance to repair and replacement, Quality Air Heating and Air Conditioning offers total heating service in Galloway, OH. When you call us for heating installation, we’ll do more than just show up at your home and install your system. Call us when you first start looking for a new heater and we can help you pick out a system that is the right size for your home and fits in your budget. If it’s repairs you need, we’re available 24/7 for emergency heating repair in Galloway, OH so call us anytime your heater starts to cause you problems. If your heating system breaks down for any reason, make sure that you call Quality Air Heating and Air Conditioning for all your heating repair in Galloway, OH. Our experienced technicians can work on a large range of systems and we can fix any issue that you might have. Whether your heater is blowing cool air or it’s started making a new noise, call Quality Air Heating and Air Conditioning for 24/7 heating repair in Galloway, OH. If the time has come for you to get a new heater installed in your home, don’t let just anyone install it. Quality Air Heating and Air Conditioning offers professional heating installation in Galloway, OH for many different types of systems. We will ensure that you get a properly sized heater so that it produces efficient and comfortable heat for many years. Call today to find out more. Don’t get caught with poor air conditioning when the heat starts to rise. Quality Air Heating and Air Conditioning offers total air conditioning service in Galloway, OH for all types of systems. We can repair your AC if it is having any issues and we can also work with you to install a brand new air conditioner in your home. We know that there are a lot of different makes and models out there, so let our experts help you find a terrific new system for you. Call us today for heating service in Galloway, OH. If your air conditioning system is producing warm air or if it is making a new or unfamiliar noise, call Quality Air Heating and Air Conditioning for air conditioning repair in Galloway, OH. These types of issues won’t go away on their own and will only likely get worse with time. We know that problems can arise at any moment so we provide 24/7 air conditioning repair in Galloway, OH. Anytime you call us, whether it’s day or night, you’ll always get a live person on the other end of the line. New air conditioning installation is a great way to help increase the comfort and efficiency of your home. However, if you want your new equipment to operate properly, you must have it installed professionally. Quality Air Heating and Air Conditioning offers fast, reliable and high quality heating installation in Galloway, OH for all types of systems. Whether you need a new central air conditioner, a heat pump, a ductless mini split, or even a geothermal heat pump, give us a call and we can help you pick out a new system. Maintenance is a missing component of many homes. Don’t let your air conditioning system fall into disrepair because you don’t get your system regularly inspected and tuned up. Quality Air Heating and Air Conditioning offers complete air conditioning maintenance in Galloway, OH for all makes and models. Our maintenance program offers our members reduced pricing, extended warranties and many other benefits as well as the potential to reduce repairs, and increase efficiency. Call us today to find out more about the terrific benefits of maintenance. Ready to Replace Your AC? It’s unfortunate but eventually your air conditioning system will need to be replaced. Quality Air Heating and Air Conditioning is the company for all your air conditioning replacement in Galloway, OH. We can talk with you about the possibility of switching to a different type of air conditioning system if you’re ready to try something new. We’ll make sure that your new AC is the proper size for your home and that it operates exactly as the manufacturer intended, so call today. For businesses, keeping the interior nice and comfortable for customers, clients and employees is critical. 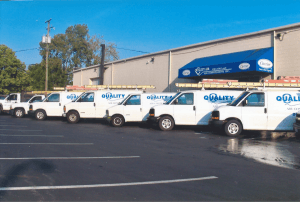 If you need any type of commercial HVAC service in Galloway, OH call Quality Air Heating and Air Conditioning. We understand how important your HVAC system is to your success, which is why we offer a full lineup of services for businesses of all types. Whether you need repair for your cooling tower or you need a new rooftop unit installed just let us know and we’ll get the job done quickly and with the high quality that you deserve. Don’t let problems with your HVAC system harm your business. The minute you suspect that something is wrong, give us a call here at Quality Air Heating and Air Conditioning and we’ll get your systems back up and working again quickly. We’re available 24/7 for commercial HVAC repair in Galloway, OH so call us anytime. We can operate on many different types and brands of equipment and our technicians are highly trained to deliver exceptional workmanship on every job. For new commercial HVAC installation in Galloway, OH it’s always best to work with a professional. Poor installation can cause years of inefficient or ineffective performance from your HVAC system. When you work with Quality Air Heating and Air Conditioning, our commercial HVAC experts will help you throughout the entire process. From picking out the system to the eventual installation, we will make sure that every step of the process is completed with the highest possible quality. Having your HVAC system tuned up on a regular basis is absolutely necessary to ensure that it is able to deliver comfortable heating and cooling no matter what the temperature is outside. Without it, your HVAC equipment could develop many different issues that reduce its efficiency and cause it to break down. Quality Air Heating and Air Conditioning offers commercial HVAC maintenance in Galloway, OH for businesses of all types which could reduce the need for repair, increase the efficiency of your system and also keep it working for longer. Plus, our members get reduced prices, priority service, and extended warranties. If you need any type of heat pump service in Galloway, OH, Quality Air Heating and Air Conditioning is here to help. We provide complete service for all brands of heat pumps including installation, repair, maintenance and replacement. Heat pumps are a great option for many homeowners because they provide both heating and cooling in one unit. If you’d like to talk with us about the possibility of switching from your current heating and air conditioning setup to a heat pump, it’s as simple as giving us a call. If you need service for your furnace because it isn’t working well, we here at Quality Air Heating and Air Conditioning offer 24/7 furnace repair for all types of systems including electric, gas and propane. The moment that you realize something isn’t right with your furnace, call for service. Waiting will only allow the problem to get larger and more costly to fix. For new installation, we can recommend a furnace that fits your budget and also matches your home’s heating needs as well. Call us today for Galloway, OH furnace service!